Kim Kardashian issued a corrected endorsement for morning sickness pill after the FDA took issue with a first post’s lack of acknowledgement of associated safety risks. 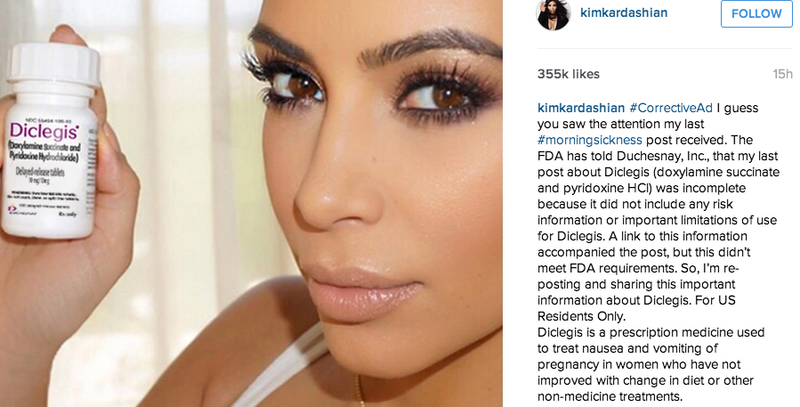 Weeks after federal regulators took issue with drug company Duchesnay for allowing mom-to-be Kim Kardashian to tout the benefits of its morning sickness pill on social media without properly disclosing the drug’s associated risk and limitations, the reality star posted updated endorsements, complete with acknowledgement of the pill’s side effects. The new “#CorrectiveAd” posts – which were quickly pushed down the page thanks to Kardashian’s posts about the MTV Video Music Awards – were mandated by the FDA after the agency issued a warning letter to Duchesnay in early August saying the lack of safety information included in Kardashian’s original July posts put consumers at risk. As a result, the FDA claims the post misbrands the pill, which makes its distribution a violation of the Federal Food, Drug, and Cosmetic Act. Regulators told Duchesnay that the misleading messages – which were quickly deleted by Kardashian in August – be corrected in the same format they were originally posted – meaning on Instagram, Twitter and Facebook. While the first posts included a link to the company’s website and Duchesnay sent out a press release providing more details about the partnership including information on Diclegis, the FDA claimed those steps weren’t enough to mitigate misinformation. Kardashian addressed those issue in her corrected ads on Sunday. The rather lengthy post goes on to include limitations – “Diclegis has not been studied in women with hyperemesis gravidarum” – and important safety information including a number of other medications that shouldn’t be taken in conjunction with the pill. #CorrectiveAd I guess you saw the attention my last #morningsickness post received. The FDA has told Duchesnay, Inc., that my last post about Diclegis (doxylamine succinate and pyridoxine HCl) was incomplete because it did not include any risk information or important limitations of use for Diclegis. A link to this information accompanied the post, but this didn’t meet FDA requirements. So, I’m re-posting and sharing this important information about Diclegis. For US Residents Only. Diclegis is a prescription medicine used to treat nausea and vomiting of pregnancy in women who have not improved with change in diet or other non-medicine treatments. Limitation of Use: Diclegis has not been studied in women with hyperemesis gravidarum. Do not take Diclegis if you are allergic to doxylamine succinate, other ethanolamine derivative antihistamines, pyridoxine hydrochloride or any of the ingredients in Diclegis. You should also not take Diclegis in combination with medicines called monoamine oxidase inhibitors (MAOIs), as these medicines can intensify and prolong the adverse CNS effects of Diclegis. The most common side effect of Diclegis is drowsiness. Do not drive, operate heavy machinery, or other activities that need your full attention unless your healthcare provider says that you may do so. Do not drink alcohol, or take other central nervous system depressants such as cough and cold medicines, certain pain medicines, and medicines that help you sleep while you take Diclegis. Severe drowsiness can happen or become worse causing falls or accidents. Tell your healthcare provider about all of your medical conditions, including if you are breastfeeding or plan to breastfeed. Diclegis can pass into your breast milk and may harm your baby. You should not breastfeed while using Diclegis.